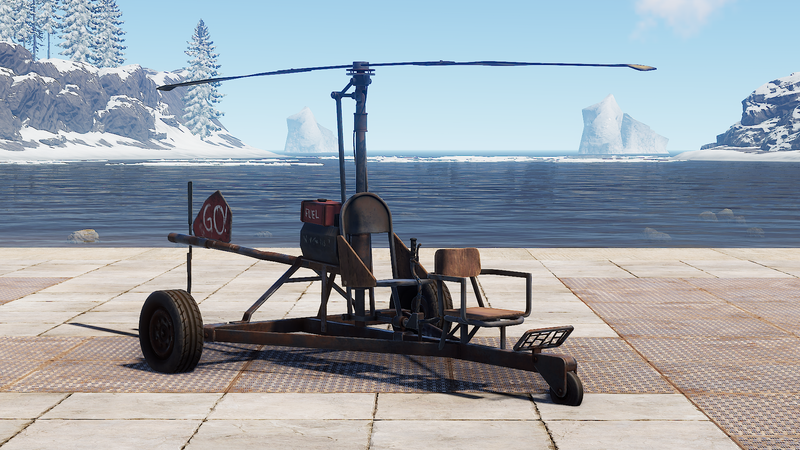 The RUST Minicopter, introduced on 2/7/2019 in the February update, is the fifth aerial vehicle to be introduced to RUST and the second to be officially pilot-able by players. 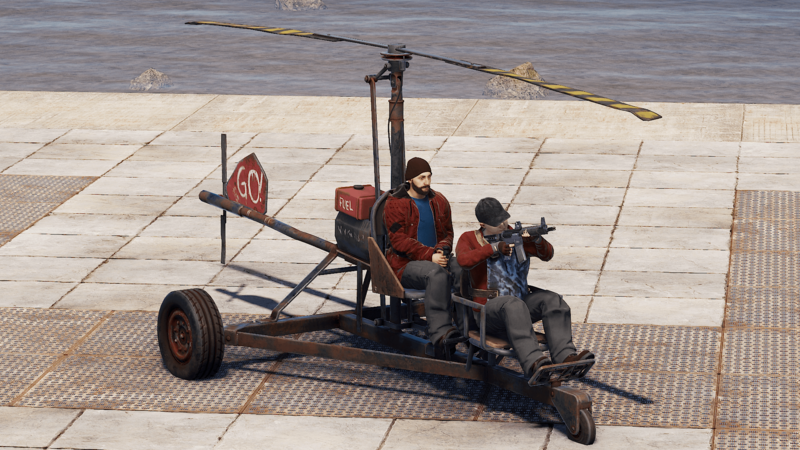 Minicopters are able to be found spread across the map and default to 1 per KM, in a similar nature to the hot air balloons, rowboats, and RHIBs. 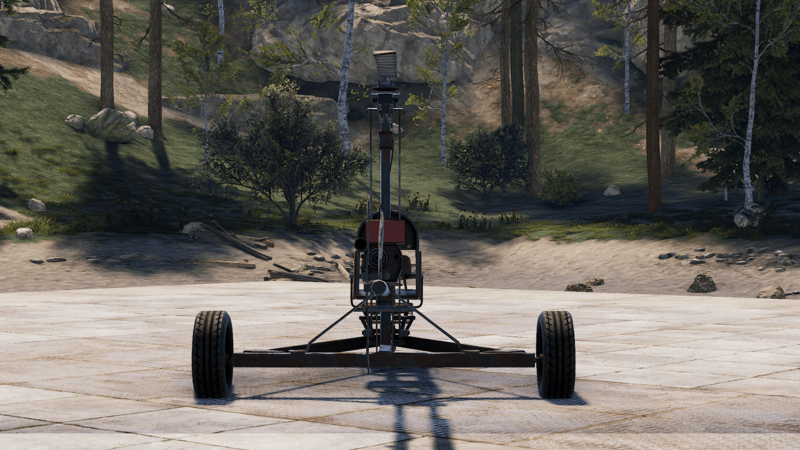 This is controlled by a variable, found below, that can increase or disable the Minicopters from spawning at all. 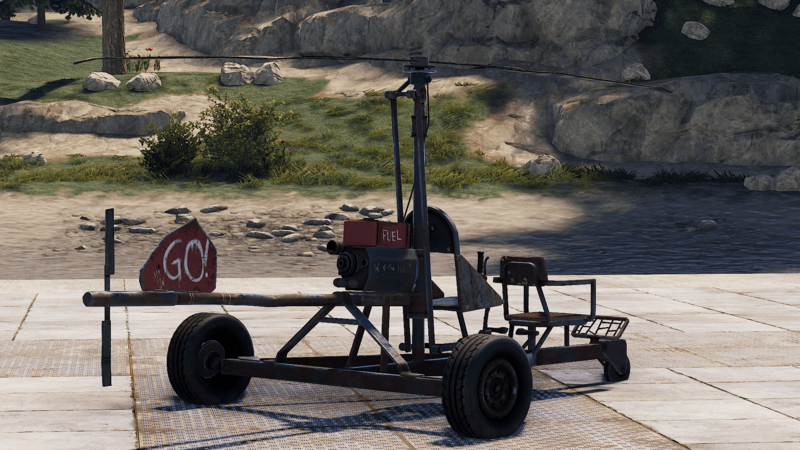 Scrapped together with a handful of pieces, the Minicopters appear to sit on the frame of a rusted boat trailer, with the wheels intact. Two makeshift chairs have been welded on, but mind the bubble gum when sitting down. The tail rudder appears to be made out of sheet metal resembling a stop sign. Directly behind the captain’s chair is a small red container, with the word “fuel” scribbled in white paint, sitting atop the portable engine. The rear and main rotor blades appear to be made of a thin sheet metal resembling, quite possibly, the only legitimate items to be grafted onto this contraption. There are two seats in total, with a max carrying capacity of two souls. One chair is designed for the pilot, closest to the engine, with a control stick positioned just behind the passenger’s seat. It’s important to note the optional passenger seat is the only seat that can wield inventory items while in flight, making the wingman the de-facto gunner, bomber, or spear chucker! The captain and passenger can also access the fuel container when using alt to look behind to the fuel container. The Minicopter’s health defaults to 1000 when they spawn into the game. 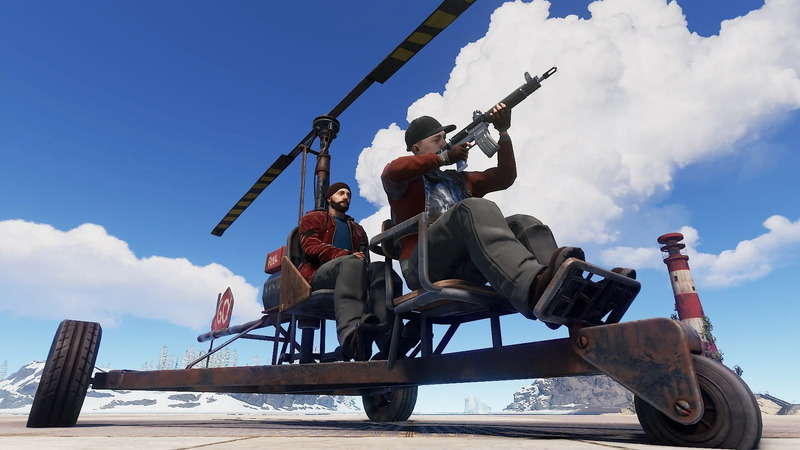 The current health of the Minicopter can be seen when actively sitting in either of the vehicle’s seats. 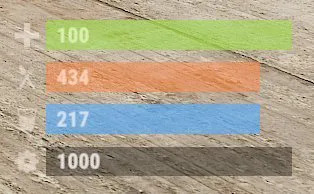 This is a new addition to the RUST UI altogether. The health meter can be located just below the hydration meter, in the lower right of the screen. 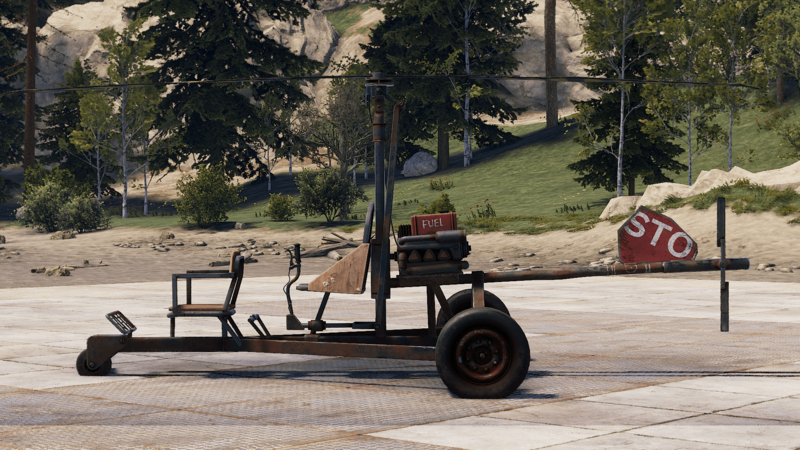 Over time the Minicopter will take decay damage when it’s not housed properly, similar to the rowboat and RHIB. It takes a total of 4 hours for the Minicopters to decay and explode. 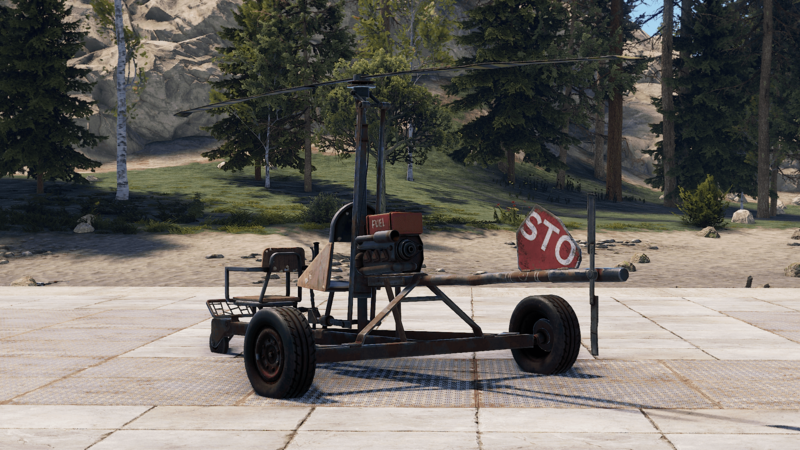 Damage done to Minicopters can be repaired using a wooden hammer and metal fragments. Each hit with the hammer will heal 52 damage and consume 13 metal fragments. 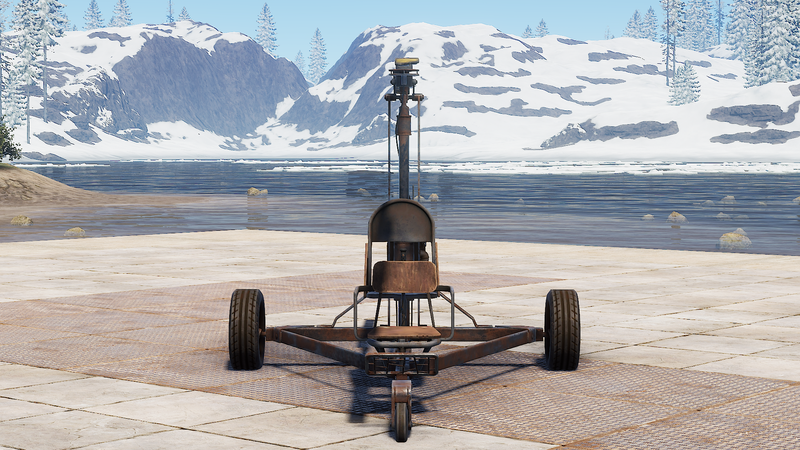 When a Minicopter hits 0 health, whether from decay or player damage, it will explode into a ball of flame, covering the ground with fire. 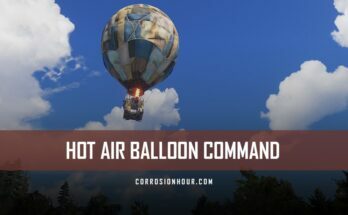 Much like popcorn, Minicopters can be heard blowing up in the distance all across the map. However, do note that the Minicopters are impervious to arrows and fire damage. When the Minicopter explodes, if players are mounted, they will die in the explosion. 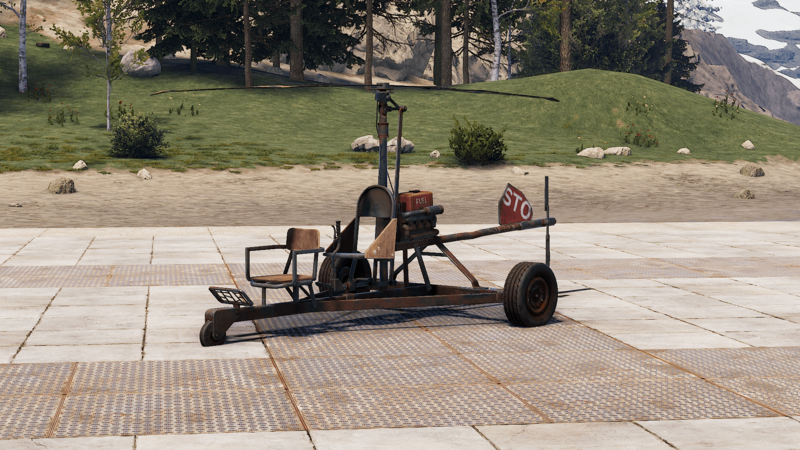 The Minicopter’s controls are very similar to the existing CH47 that is already in the game, but only spawn-able by admins. To turn the Minicopter on, simply add low-grade fuel to the gas tank behind the captain’s chair. It can hold up to 500 low-grade fuel, which can run the Minicopter in the air for a total of 16 minutes and 30 seconds before the engine disengages. Next, mount the captain’s chair and press the W key once. Pressing this key will turn the Minicopter’s engine on and will engage the propellers. There isn’t a mechanism to disengage specifically, but it will shut off automatically if a player exits the captain’s chair by pressing the spacebar key. 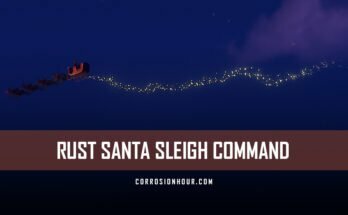 The RUST Minicopter command can be issued and configured on vanilla RUST servers by RUST admins and moderators only. 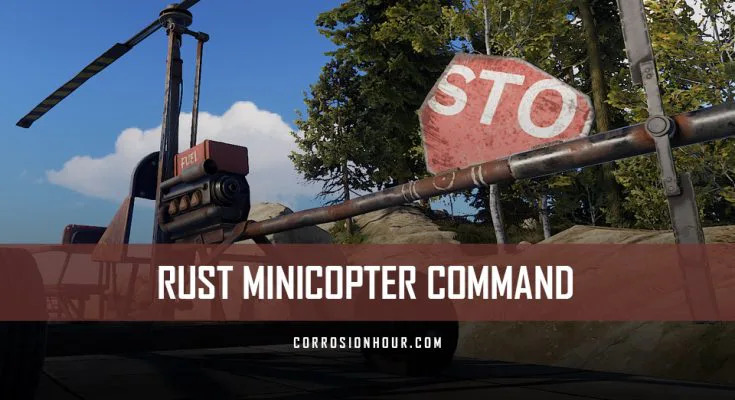 Non-admin players on vanilla RUST servers cannot use the RUST Minicopter command and variables but will be able to find the Minicopters scattered across the map on vanilla servers. minicopter.population 1 Population active on the server.